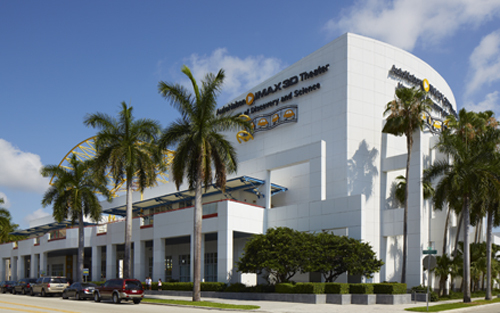 Experience the power of IMAX at the AutoNation® IMAX 3D Theater which features the BIGGEST screen (60 ft. x 80 ft.) in South Florida. Your adventure is Bigger, Bolder, Better with a 15,000 watt digital sound system that delivers six discrete channels of clear sound through 42 speakers. The IMAX projector’s 15,000 watt Xenon bulb projects images of unsurpassed brilliance and clarity onto the five-story-high screen. Both 2D and 3D films are shown in the theater. 3D films are viewed using XR 3D glasses. The IMAX immersive experience is an unparalleled fusion of sight and sound.